No matter where you travel in Latin America, you'll find grilled meat, carne asada, on the menu. Seafood and poultry are also grilled at parrillas, restaurants specializing in grilled foods. Particularly popular in Argentina and Colombia, the mixed grill called Parrillada Mixta can be any combination of meats and poultry. In Brazil, the churrascaria rodizio is tremendously popular. Rather than ordering a set combination of meats, diners select from the grilled meats brought around the restaurant on large skewers. When they can eat no more, they turn their table token from the yes to the no side. A Parrillada Mixta del Mar is a mixed seafood grill served with garlic butter or Tartar sauce. In Argentina, the meat is often grilled at the table and includes various cuts of steak, lamb, pork, sausages, sweetbreads, and internal organs not often found on US menus. The meat is cooked in huge cuts on a spit over a fire, and sections cut by the grill chef, or asador, to be finished to taste, either in the kitchen or at the diner's table on a portable grill. Grilling is in the following order: sausages, offal, then the steaks. The parrillada is best when eaten immediately and is sometimes served with lemon wedges, and in Argentina, always with Chimichurri, a sauce either purchased or made fresh at home from oregano, garlic, parsley, spices, vinegar, and oil. It is also used as a marinade before cooking. Prepare the sauce several days before using. Variations include adding hot red pepper flakes, red or white vinegar, soy sauce, tomatoes, sherry or Adobo Seasoning. Although the sauce contains a lot of garlic, the after-effects are canceled out by the parsley, a natural breath freshener. 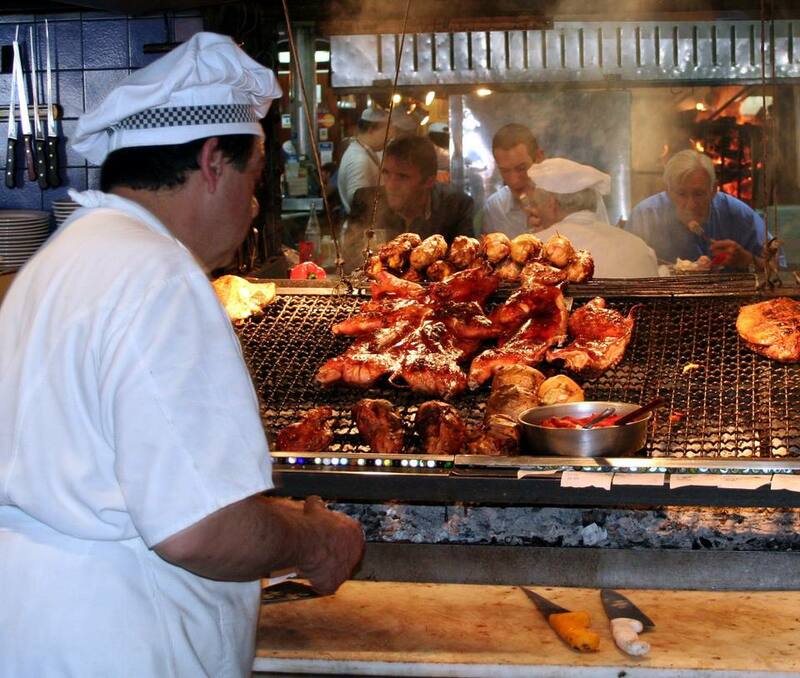 First-time visitors to Argentina are often surprised by the amount of meat consumed at meals. Unless the number of servings is specified on a menu, you can expect a regular order to serve three to five non-Argentinians. Some parillas add onions or other vegetables, such as yuca or mushrooms to the mix. Simple side dishes are the usual accompaniment to the parrillada, most often papas fritas, or French fries, or mashed potatoes, and a salad, sometimes a combination of avocado, tomato, and hard-boiled eggs. To make this salad, pour a dressing of olive oil, red pepper flakes and salt and pepper to taste to taste, and lemon juice over a combination of chopped tomatoes, avocado, hard-boiled eggs, parsley, and cilantro. Mix well and refrigerate. In Mexico, you're likely to get beans and tortillas served with your parrillada. The bold flavors of a parrillada mixta demand a red wine. Chianti, Merlot, Pinot Noir, Cabernet or Zinfandel go nicely with meat, but of course, the choice is up to your taste. Of course, you'll want an Argentinian wine to go with this favorite Argentinian dish. If you have room for dessert after your parrillada, the ever-popular flan or fruit is a good choice. Though it might be more fun to try a parrillada mixta in South America, you can also prepare all the ingredients at home.